Starting March 2019, the Traxx DC3 locomotive can enter commercial service, as the Italian national railway safety authority, ANSF, granted Bombardier the authorisation for the Italian rail network. 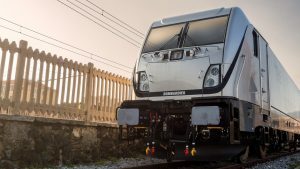 Bombardier will apply for the Authorization to Put In Service (APIS) per conformity which makes it possible to put the locomotive series into operation, enabling company’s customers and operators to register and begin operating their Traxx DC3 locomotive fleets. Commercial service is planned to begin in March 2019. Traxx electric four-axle locomotives are manufactured in three models – Traxx AC3, Traxx MS3 and Traxx DC3 to cover Europe’s mainline applications under all four catenaries and offer optional Last Mile functionality, a support diesel engine which bridges non-electrified sections. In December 2017, Bombardier and Mercitalia Rail signed contract for 40 Traxx DC3 locomotives, valuated at EUR 210 million. The contract also includes options for up to 20 additional locomotives and maintenance services. Under the contract, 16 years of fleet maintenance will be carried out by Bombardier Transportation Italy’s Services division.